The name Munnar is believed to mean "three rivers" referring to its location at the confluence of the rivers Mudhirapuzha, Nallathanni and Kundaly. Munnar was once the tiny retreat of the English who ruled in South India. 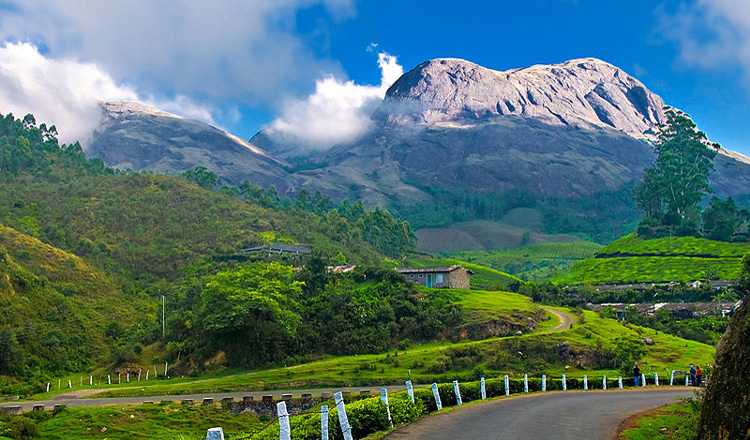 Dating back to the British Empire era in India, Munnar is undoubtedly the prime-most attraction of Kerala. One of the best ways to explore Munnar is by taking a cycle tour of the area. Hire a cycle and explore the manicured tea plantation, enjoy gushing waterfalls, explore shimmering lakes and discover an animal called the Nilgiri Tahr in Munnar's Eravikulam National Park. The famous tea brand called The Kannan Devan is responsible for bringing Munnar on the world map since 1877. The tea plantation at Munnar was developed by a British resident, John Daniel Munro. It did not take long for the English to understand many of the hilly areas of Kerala that were well-suited for planting tea. Once famous as the 'High Up' of Travancore, presently Munnar is the shopping center of one of the world's highest tea growing gardens. There are 30 odd tea gardens in Munnar that produce the best quality tea. Paradise for nature lovers, Munnar is one of the tallest and largest tea gardens in the world. The winding lanes are constantly perfumed with the scents of the plantations. Anamudi, the highest peak of South India (2695m) is also in Munnar. Finally, in the surrounding tropical forests you can see different species of animals: nilgiri tahr, nilgiri langur, sambhar deer, gaur and lion-tailed macaque. Perched in the middle of the manicured tea gardens with murmuring water currents and exotic flora and fauna, Munnar is a land of pleasure for adventure seekers. The preserved and gentle hills of Munnar offer an excellent range of opportunities for adventure enthusiasts to engage in action-packed adventure activities. Sailing on the hills via paragliding and enjoying the mesmerizing view of the beautiful Munnar landscape should certainly not be missed. A paradise for bird watchers and wildlife aficionados, Eravikulam National Park is just an hour from Munnar. In the national park, one can get an opportunity to discover Nilgiri Tahr. These mountain goats are believed to be on the verge of extinction. Many flora and fauna options keep one enchanted during the jeep safari trip. Other places worth a watch on a short trip to Munnar are Kannan Devan Tea Museum, Kundala Lake, Marayoor Sandalwood Forests, Blossom Hydel Park, Echo Point, Roseraie, Mattupetty, Rajamalai National Park and Lake Elephant. Munnar is well known for its huge expanse of Neelakurinji flowers. The interesting aspect of flowers is the fact that it blossom once in twelve years. The 'Kurinji' season in Munnar is a magnificent view as the hills and valleys are covered by flowers of Neelakurinji. Make a visit to Munnar tea garden and learn the art of tea making in a century-old tea factory. One can also go to the Tata Tea Museum to see the process of tea packing. Visit the city by bike or bicycle. An elephant ride to Lake Elephant. Munnar is the best place to buy tea, spices, strawberries, congratulatory cards made of handmade paper, aromatic oils and homemade chocolates.